Man-made noise is everywhere. Even when you think it’s quiet, it’s probably not. Close your eyes. Listen. ... Cars. Distant airplanes. A lawn mower. We buy earplugs and noise-canceling headphones. But what about finding places where there is no human noise — where the sound of silence is wind, coyotes, the drip-drip of melting snow? 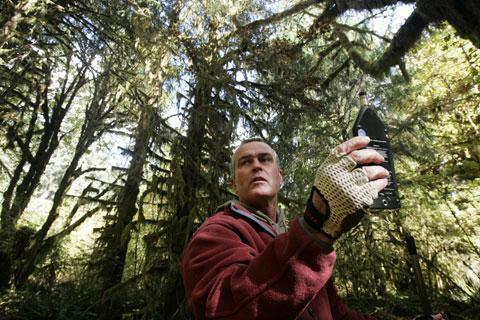 Sound ecologist Gordon Hempton has devoted his life to finding places devoid of human sound. He says silence is an “endangered species” that must be saved, before it’s too late. Gordon Hempton, acoustic ecologist and Emmy Award-winning sound artist who has provided sound for Microsoft, Disovery, and NPR. His recordings were featured in the PBS documentary "Vanishing Dawn Chorus," which earned him an Emmy Award for "Outstanding Individual Achievment." He's author, with John Grossman, of "One Square Inch of Silence: One Man's Quest to Preserve Quiet." You can read an excerpt. This program aired on April 22, 2010.